Treasury Secretary Steven Mnuchin held calls on Sunday with the heads of the six largest U.S. banks in order to reassure nervous investors. The NYSE closes early on Monday at 1 p.m. ET. The exchange is closed on Tuesday for Christmas day. The Dow Jones Industrial Average dropped by 653 points Monday in volatile trading, falling below 22,000. The Dow sank more than 2 percent, then recovered nearly all of the day’s losses, before again falling more than 2 percent. The S&P 500 fell 2.7 percent, slipping into a bear market, falling 20.06 percent from recent highs. Wall Street traditionally considers a drop of 20 percent or more from recent highs to be a bear market. “Violent volatility resumed as tumbling bond yields, a flattening yield curve and lingering questions about the G20 US-China trade truce combined to stoke increasing recession fears. While US growth is still holding up OK, worries are increasing about the overseas economic outlook. 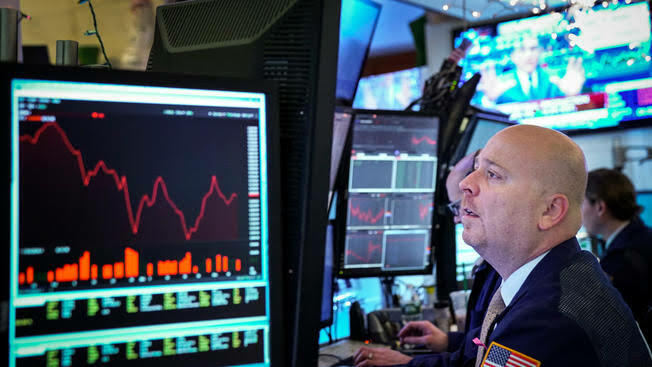 All this macro-economic uncertainty is clouding the 2019 earnings outlook, leading to increasingly violent equity swings as investors try to handicap what 2019 will look like,” Alec Young, managing director of Global Markets Research, FTSE Russell, told ABC News. “Cyclical sectors like technology, financials and industrials led markets lower, while defensive areas like utilities and real estate weathered the storm best. Until confidence in the global economy improves and bond yields stabilize, market psychology is likely to remain fragile,” Young added.